IPOH, 6 June 2012 – Malaysia needed to give better notice to its domestic investors given the present volatile economic conditions as that could cushion the impact of the global crisis. Deputy Vice-Chancellor (Academic and International Affairs) of The National University of Malaysia (UKM) Prof Datuk Dr Noor Azlan Ghazali said: “when we talk about investments we always focus on foreign direct investments (FDI). “It is time for Malaysia to give the red carpet treatment to its domestic investments,” he said at the National Economic Forum “Realising Economic Transformation; Issues and Challenges” here today. Prof Noor Azlan who is Head of the Economics and Management Cluster of The National Professors Council said domestic investors always complain that the front door is only opened to FDIs while the domestic investors can only expect the back door treatment. He said there is a serious need to strengthen the economy with domestic investments, because relying too much on FDIs mean the country will be at the mercy of global economic crisis which tends to be contagious. He cautioned that since more than 40 percent of Malaysia’s households are currently in the low income bracket, measures needed to be taken to ensure that the group will be able to afford the quality of life of a developed nation which have higher living standards. “Moving to a developed nation status requires us to live in a developed way with high standards. But if 40 percent of your households cannot afford to pay for that kind of standard, then there will be problems,” Prof Noor Azlan said. He attributed the situation to the unequal income distribution which he described as most worrying saying that for the economic transformation to move forward it must touch all layers of society. An excessively unequal income distribution was what made the rich getting richer and the poor getting poorer. Such a situation will lead to various social problems and instability. The solution, he said, is to boost the domestic sectors because a vibrant domestic industry will ensure incomes are better distributed. He said Malaysia has to be very selective in the investments that it chooses as this will reflect the kind of jobs that will be created. While on the one hand universities are producing graduates in many fields of studies, the jobs that are being created only require school leavers with minimal education. That will inevitably lead to various problems. 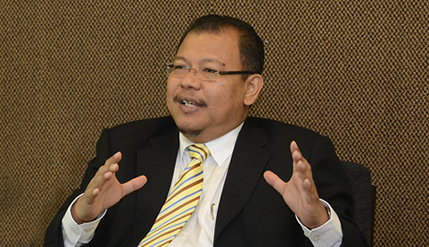 The key that will drive Malaysia to becoming a developed nation is to boost the domestic sector, Prof Noor Azlan said. Deputy Director General (Policy) of the Economic Planning Unit (EPU), Encik Nik Azman Nik Abdul Majid said one of the problems faced by the country is the quality of graduates and the workforce being churned out. Despite increases in the number of higher educational institutions over 70 percent of the workforce only have school level certificates like the SPM. He mentioned the problem faced by a well known hundred year old foreign company with an internationally recognised quality brand that wanted to build a factory manufacturing jet engines here and needed 2000 highly qualified engineers. Though the company was willing to give lucrative salaries there was just not enough such qualified engineers to meet the company’s requirements to the extent that Malaysia had to negotiate to bring in foreign engineers while at the same time train our engineers to fill future jobs. Though higher institutions of learning are mushrooming there was the quality issue of graduates that were being churned out that needed to be addressed, he said. Employers were complaining that they needed to train the graduates first before they can work. That was why the government had taken the initiative to promote linkages between universities and the industry. While the quality of graduates were questioned the choices of investment was equally to be blamed with the forum agreeing that there needed to be greater cooperation between the industry, higher learning institutes and policy makers. Dean of the Faculty of Economics and Management, Prof Dr Nor Ghani Mohd Nor, industry leaders and policy makers attended the conference.